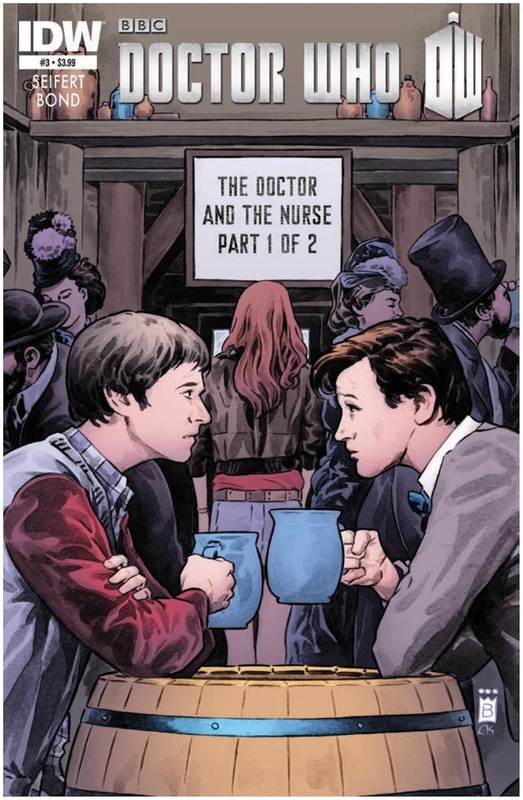 The Fellowship was fortunate enough to obtain a copy of DOCTOR WHO #3 from IDW Comics. The story is by Brandon Seifert with art by Philip Bond and colors by Charlie Kirchoff. Amy, being tired of Rory and the Doctor always arguing, comes up with the idea that the guys should have a “boys night out” to get to know each other better. So the trio arrives in 1814 London and Amy decides to go sight-seeing while the boys head to a local pub for beer. Once Amy leaves them, the guys head back to the Tardis thinking they would jump ahead a few hours and let Amy do her walking around while they avoid the bonding time. But of course it never works out that way, does it? First the boys wind up in London 1940 during the blitz, then in Los Angeles battling a saber tooth tiger and a woolly mammoth. Meanwhile, Amy discovers that an agent of the Silence is there in that time period. She follows him to find out what he is doing. Will she become a victim of that date in history? I’m not a big DOCTOR WHO fan but I did enjoy this issue. That’s probably because I like the writing of Brandon Seifert (WITCH DOCTOR), especially the humor. We know how the story will end, but the trick is to make you worried regardless. I am definitely curious to see how we get there. DOCTOR WHO #3 is in stores now and available at www.idwpublishing.com.